Everyone knows that the first step to saving a princess is to wear a green tunic and cap! Why do you think Link does it in every single Legend of Zelda game? Sure, it's pretty cool looking, but it's actually the first requirement to being a hero in Hyrule. (Having the Triforce of Courage never hurts either). 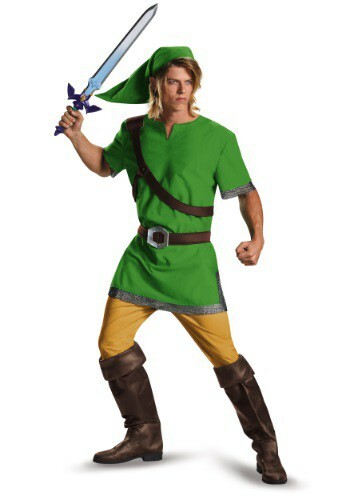 This Link costume brings the classic look from the video game to you. Some guys need helmets to do battle with evil, but Link? He just needs his trusty green cap! We're not sure if it holds any sort of magical powers, but he does look quite dashing in it. This Adult Link Hat is a version that comes straight from the Legend of Zelda video games, so you can be sure to get your princess-saving style in motion. Ready to go on your own quest? Well, you're going to need a hook shot, a master sword, a bow and arrow, a compass, a map, but FIRST you're going to need the traditional forest kid look, and we can help you with that! 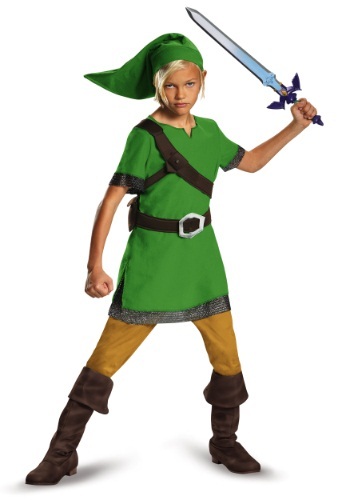 This Link costume for kids will be instantly recognizable to any fan of the Nintendo franchise. Unfortunately, we can't take any rupees in trade, but we think you're going to love it all the same. And if you choose to roll around in the grass, don't bump your head on any trees! (And be nice to chickens, please). Are you losing to normal Link on a regular basis, Zelda game after Zelda game? It's time to up your defensive game. The next time that do-gooder hero tries to send you back the realm of darkness, you'll have this Dark Link Legend of Zelda Foam Shield waiting for him! It deflects hookshots, boomerangs and all manner of swords. It's exactly the thing you need to make your boss battle the one that drains all of his hearts. Even heroes with seemingly pure hearts have something to hide. Everyone has a little bit of darkness dwelling within in them. Link? He secretly likes to aggravate innocent chickens. That's where we think Dark Link came from. 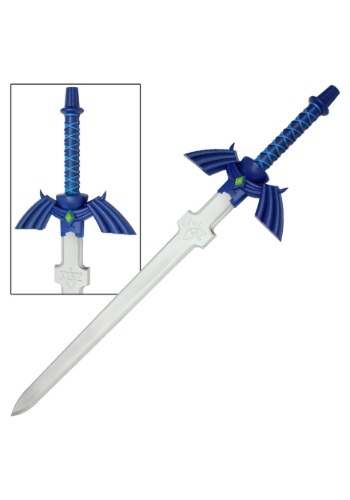 If you secretly like harassing chickens in the video games games, more than you actually like saving Hryule, then maybe you feel a little more like Dark Link, in which case, you need a sword that matches your mood. 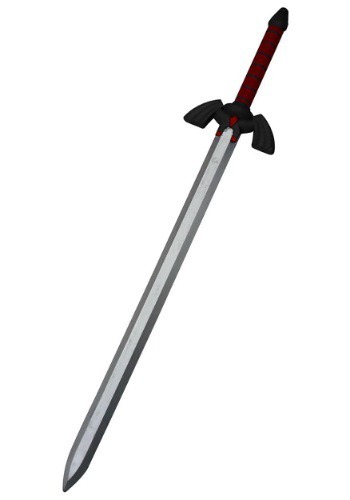 The normal Master Sword won't do it, but this Dark Link Legend of Zelda Foam Sword will! It has the hero's signature style, but with a color palette swap to match your evil ways. If Legend of Zelda games have taught us anything, it's that it's really only a matter of time before Ganondorf comes back and starts wreaking havoc. Someone has to wear the green tunic and stop him and we figure, it might as well be you! It may take a while for him to show up, but you can always just spend your off days hacking away at grass and bushes in search of precious rupees. Has anyone seen Ganondorf? Link has his Master Sword and he's ready for an epic battle. Also, he has a pocket full of rupees he found from chopping at the grass so you could say that the Master Sword has brought him luck thus far. Just, please don't bring the sword around the chickens. That always riles them up. Whatever you decide to do with the Master Sword, an adventure will ensue. Here's a quick guide to saving a kingdom from the forces of evil. First, get yourself a green tunic with a matching pointy hat. Second, get a magical sword imbued with the power to destroy even the most powerful villain. Third, you'll need to go on a long and arduous journey to collect a myriad of magical items, like a boomerang, a bow, some empty bottles and maybe a power bracelet. Then, and only then, will you be ready to take on legendary video game bad guys. It all starts with that first step though, the green tunic with matching hat and armor. Fairy experts have called us crazy, but we think that the secret to fairy magic lies within their pointed ears! All of our extensive testing with these fairy ears has been inconclusive, but we did find out that it's pretty fun to put them on and act like a fairy. 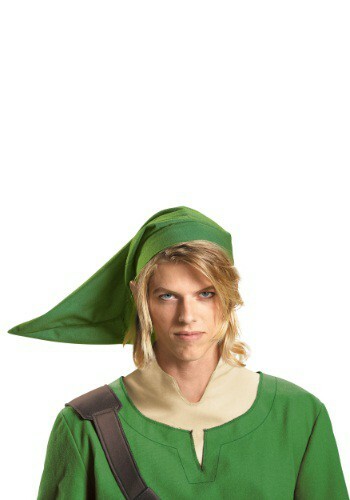 If you are planning to dress up as Link, let us be the first to congratulate you on a fine choice in character costumes. Next, let us help you prepare for the hours of cosplay and costume parties that will surely follow with this licensed Zelda sword. It is made of lightweight foam, so it's easy to carry everywhere while on your adventure to save the princess! Link sure does take his sweet time saving Hyrule, doesn't he? By the time he's done playing around with boomerangs and ocarinas, the kingdom is almost in ruin. It just goes to show, that if a girl needs a job, she needs to do it herself! 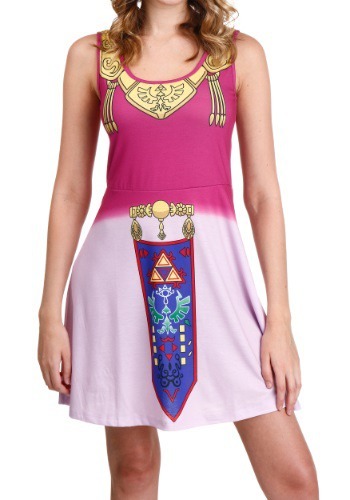 This Legend of Zelda I Am Zelda Skater Dress lets you look like the legendary princess, so you can go ahead and save the kingdom yourself! You can probably grab the Master Sword and defeat Ganondorf before Link's finished with the first dungeon! This here is an one bag that rules ... Hyrule's, if you will. Want to show your affinity for Zelda? Then take this tote with you, everywhere you go. It takes a lot to be a Hyrule hero, like courage, strength and a really cool green hat! A set of pointy ears never hurts either. Link has them and he's saved Zelda and the people of Hryule over a dozen times. That's a pretty good track record, so we think he must be doing something right. This Link Adult Kit comes with everything you need to get your look started, so you'll be ready to find the Master Sword in no time. (You may have to lurk around dungeons to find the boomerang though). When you're fighting Ganondorf or off trying to find the hookshot, it's hard to find time to keep your hair looking heroic. 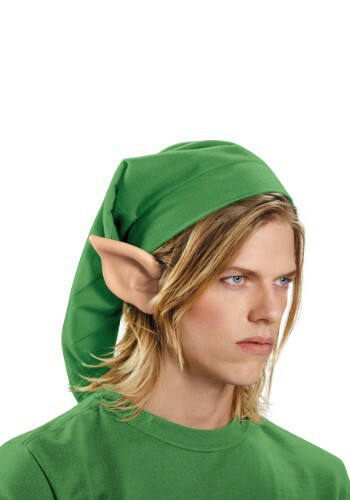 This Link Adult Wig solves that problem! Since it's based on The Legend of Zelda character, you'll always have a perfect Hyrule style, so you can worry about cutting that moblin down to size instead of how your hair looks. You can't just walk around town claiming to be a hero in a pair of jeans and a shirt! (Well, you probably can, but no one will believe you). 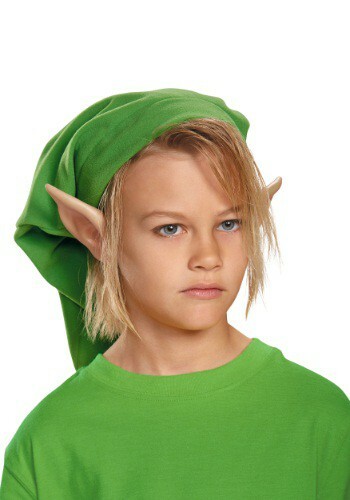 With this Link Child Hat everyone, including Princess Zelda, will know that your kid is a hero. It's stood the test of time; every Hyrule hero since 1986 has been wearing it. Hryule is ALWAYS in trouble. Whether it's Ganondorf, Zant or Vaati, there's always an evil scheme in the works. The good news is that there's always someone willing to pick up the Master Sword to defeat the bad guys and chop down grass that might be hiding rupees. But before your kid can pick up the sword, he needs the gear of a true hero! Lucky for you, this Link Child Kit is the perfect starter set to make your child look like the hero Hryule deserves! Start him off with this and send him to dungeon number 1 to get the boomerang! Have you ever wondered what makes someone worthy of wielding the Triforce of Courage? It doesn't take heroic acts or cool weapons (although both of those never hurt). All it takes is the right hair! 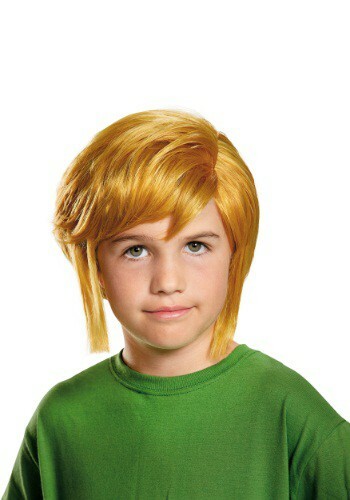 This Link Child Wig has the look straight from the Legend of Zelda games and gives your kid the hair of a Hyrule hero. Link's been in quite a few Legend of Zelda games. In some he's a kid, in others he's a teen. In some games he has a grandma and a sister and in others, he's just chilling in a shack by himself. One thing is always the same though. Link always has a pair of pointy ears. It's a Hylian thing. These Link Hylian Adult Ears are just the accessory you need to complete your transformation into the classic Nintendo character. You know how it is. On your coming of age birthday, your sweet old Grandma makes you wear this green tunic and weird hat so you can slay evil or something or other, even though all you really want to do is take naps on the dock in your lobster t-shirt. (Really, that lobster t-shirt is the best t-shirt for taking naps in). You can save Grandma the trouble this time by wearing this Legend of Zelda costume hoodie, modeled after Link's outfit from The Wind Waker. That way, you can just wear your lobster t-shirt underneath it and zip-up when the bad guys come looking for trouble. Guess which princess has gotten in a jam again? That's right, Princess Zelda! It seems that girl can't go a day without the Kingdom of Hyrule falling into disarray. No worries, though. You're up to the challenge of gathering a bunch of cool magical tools and dishing out some justice to Ganondorf, right? 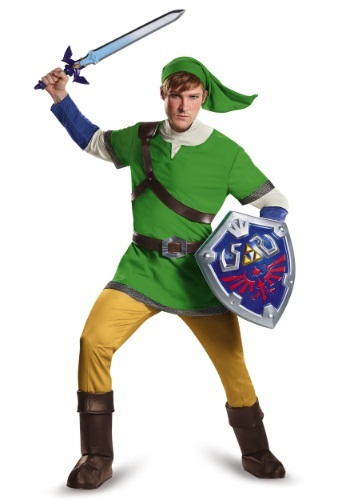 With this Plus Size Link Costume you can let Link take a break from the whole Hero of Time thing and you can play around with the Master Sword and the Hookshot. Are you going to sit around waiting for the Hero of Time to come and take care of your moblin problem? Why not take a proactive approach to the problem and start taking them on yourself? 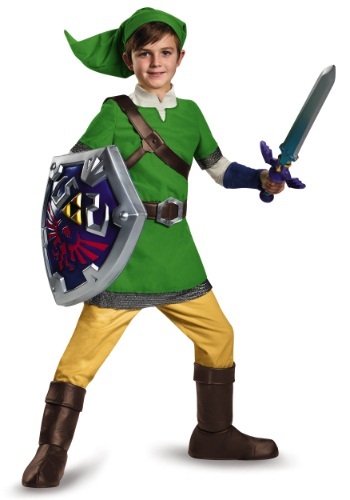 With this Plus Size Link Costume, you can assume the role of Hyrule warrior! It has the classic green tunic and cap from the Legend of Zelda games, so no one will mistake you for some random citizen. 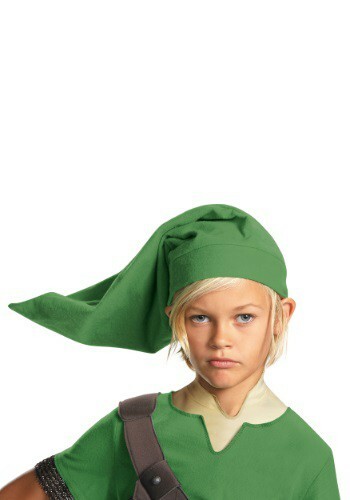 The only downside to this costume is that Navi might start following you around, shouting, "Hey, listen," at you. (Come on Navi, can't a guy take a second off to look for a Heart Piece)? If you want the ultimate Link costume from the Legend of Zelda, it starts with having authentic accessories. 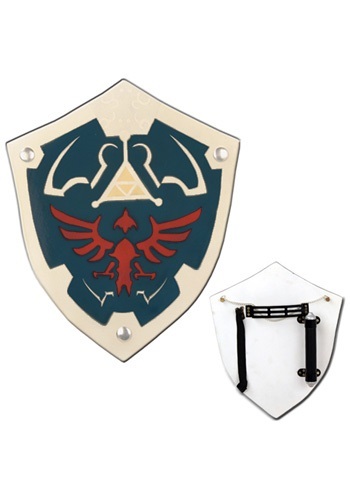 This Zelda Triforce shield is a licensed replica of the one shown in the video games. You are guaranteed to look awesome holding it and will earn the respect and admiration of fellow gamers. 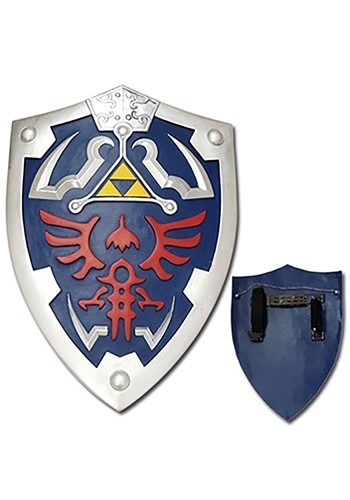 If you are going to dress up as Link, do it right with this Hylian Shield! This replica wooden shield is just like the one Link uses in the Legend of Zelda. When you take on Ganondorf for your final battle, you'll be ready.